Candles /Apple & Acorn "Time & Again"
From "Time & Again", these elegant glass candles with glass lids make a thoughtful gift, especially appropriate for teachers! 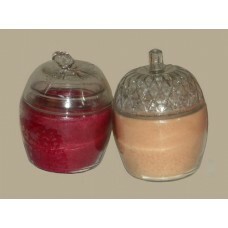 Size: 5" H. x 3 1/2" R.-- Customers can choose either the delightfully scented "Vanilla Spice" Acorn or "Apple Spice" Apple. Add $6.00 for Name, if desired.